Find hotel near St Nicholas Church, Falco ..
To witness history and to feel blessed, you can a plan a tour of the St Nicholas Church, Falcon Square, Castle Hedingham. According to the records, the church started its journey in the early period of the twelfth century. The church carries Norman styled architecture along with medieval stone work. Not only as a religious place but as a significant part of history also, the church appeals the tourists. It actively offers many religious services to people such as Baptisms, Pastoral care, Weddings, Children’s services and Funerals. The authority is warm and welcoming and it treats all with love and respect regardless of their originality, language, and race. You and your companions will be more than delighted to come here. Find the joy in planning a D.I.Y. trip by using this awesome Castle Hedingham trip planner. Book perfect hotels in Castle Hedingham like The Bridge Street Historic Guest House, Holiday Inn Express Braintree and The Bell Hotel. 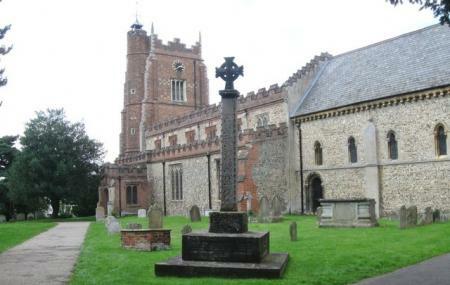 If you want to add the visit to St Nicholas Church, Falcon Square, Castle Hedingham in your trip, you can choose from the variety of Castle Hedingham vacation packages that can be designed to suit your preferences. These packages also cover your major concern of how to reach Castle Hedingham. Love this? Explore the entire list of places to visit in Castle Hedingham before you plan your trip. Fancy a good night's sleep after a tiring day? Check out where to stay in Castle Hedingham and book an accommodation of your choice.